Check out this great music video - at first I hated it the song but then I loved it. Meghan Trainor. "Its all about the Bass" Its infectious. Joyful video and song. Its sort of an ode to positive female body image. 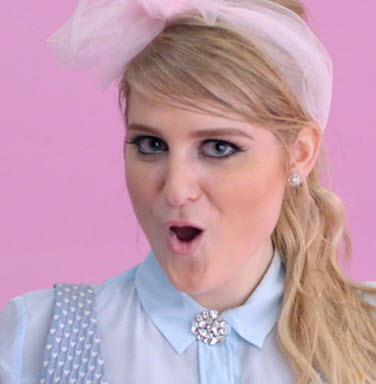 Meghan Elizabeth Trainor[ (born December 22, 1993) is an American singer, songwriter, and producer. She started writing songs when she was 11 and began producing them on her computer 2 years later. At 18, Trainor signed a songwriting deal with Big Yellow Dog Music, penning tracks for Rascal Flatts and Disney star Sabrina Carpenter. In 2011, she wrote and self-released two albums, I'll Sing with You and Only 17. In 2014, Trainor gained prominence with her debut single "All About That Bass", which reached number 1 on the US Billboard Hot 100 and topped the charts in other countries such as Australia, New Zealand, Canada, Germany and the United Kingdom.